Having resisted unilateral guarantees for EU27 citizens in the UK for over two years, and having promised to protect EU27 citizens unilaterally after all back in September, the UK government finally produced a paper today on what happens to EU27 citizens in the UK – and UK citizens in the EU27 – in the event of a ‘no deal’ Brexit outcome. The Commission’s recent communication on a ‘no deal’ Brexit included its view on the same issue from the EU side. With the vote on the withdrawal agreement looming in the UK Parliament (see my overview of the whole agreement here), it’s an opportune moment to examine what would happen to these five million people if there’s no agreement. The starting point is that the ‘settled status’ scheme for EU27 citizens in the UK would work in the same way as under the withdrawal agreement (which I discussed the details of here), including a five year period to leave and then return. However, this would not be an international law obligation, so the UK government would be free to change the details at some later date. For instance, it could have stricter rules on what happens when workers become unemployed, or otherwise regarding the definition of ‘worker’, or as regards qualification for permanent residence. But for now, the government does not intend to do so, stating that the ‘basis for qualifying will remain the same’ as under the planned scheme. There are some differences with the planned settled status scheme, however. There would not be a transition period to the end of 2020 (extendable to 2022), because the withdrawal agreement creating it would not exist (on that transition period, see discussion here). So EU27 citizens arriving after Brexit Day would not be able to qualify under the new scheme. The deadline for registration for settled status would end earlier, at the end of 2020. The lower threshold for expulsion under UK law would apply for crimes committed after Brexit Day, rather than crimes committed after the end of the transition period. For family reunion, there would be two cut off dates for applying the more generous rules on EU free movement law. First, there could be family reunion under the EU rules if the family link was created by Brexit Day. Such family reunion could take place within the following three years. Secondly, EU citizens with settled status could invoke the EU rules for family links created after Brexit Day if the family reunion took place before the end of 2020. After then, stricter UK rules would apply. This is stricter than under the withdrawal agreement, which would apply the EU family reunion rules without a time limit as long as the family link was created by the end of the transition period. In institutional terms, there would be no jurisdiction for the CJEU as regards EU27 citizens in the UK (it would have residual jurisdiction for eight years after the end of the transition period, under the withdrawal agreement, to interpret the citizens’ rights part of that treaty). It is not clear if the independent monitoring authority for the rights of EU27 citizens in the UK, which would be set up under the withdrawal agreement, will still be set up in a no deal scenario. There would not be a right of appeal for EU27 citizens, but rather just administrative review and judicial review. There would be equal treatment for access to benefits, education "broadly on the same terms as now”. The apparent qualification is not further explained. There is no reference to the export of benefits, ie to children of Polish workers in the UK who are still living in Poland. Qualifications recognised if an application to that effect is made before Brexit Day, or if they were already recognised by then. As it admits, the UK government cannot alter the position of UK citizens in the EU27. It can make decisions on some issues, however. The government commits itself to uprate pensions for UK citizens in the EU27, subject to reciprocity. It makes no comment on EU27 citizens who have paid into a UK state pension and then returned to the EU27. It will give UK citizens equal access to the NHS if they return to the UK. There is an alarmingly vague statement about non-UK family members of UK citizens who return to the UK (this would apply to those with both EU and non-EU family). Surely in the interests of equality with EU27 in the UK, as well as protection of family life, it would make sense to maintain the government’s prior commitment to apply EU free movement rules to UK citizens who return with their families before the end of 2020. Cumulation of social security contributions (ie combining contributions made in the UK and France) will be up to negotiations. The UK commits to voting rights for EU27 citizens in English local elections in May 2019 local elections (there is no mention of afterwards, and voting in Scotland and Wales is up to devolved governments to decide upon). The government is seeking reciprocity for voting rights of UK citizens in the EU27. (Note that because the issue relates to EU citizenship, voting rights are not covered by the citizens’ rights rules in the withdrawal agreement, and expressly excluded from the transition period rules). For its sake, the recent Commission paper on the no deal scenario stated that UK citizens could apply for long-term residence status as non-EU citizens on the basis of the relevant EU law. 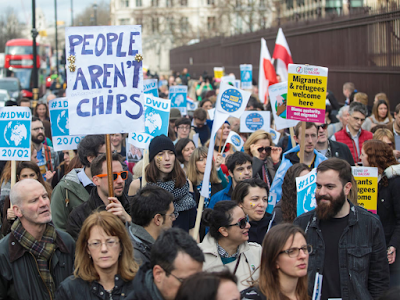 But it made no reference to the position of those UK citizens who would not qualify, for instance due to spending less than five years in the country. Even if there’s no deal with the EU, the UK would still seek a deal with EFTA States (Norway, Iceland, Switzerland and Liechtenstein), so EFTA States citizens in UK and UK citizens in EFTA States would have rights "broadly as now". There are no further details of what this might mean. The UK government has now made clear that EU27 citizens in the UK would be mostly, but not entirely, in the same position as they would otherwise be if the withdrawal agreement is ratified. They would not, however, obtain rights if they entered during the transition period or have access to the CJEU. From Brexit Day, it would be easier to expel them and their family reunion rights would be curtailed. There might not be a monitoring body helping to enforce their rights. Along with EU citizens, there might be problems cumulating social security rights. UK citizens in the EU face the utter indifference of the Commission, and so in practice their position would largely be up to national law. There is therefore a risk that, depending on their circumstances and the actions of the Member State where they reside, they would be far worse off than under the withdrawal agreement, despite its flaws (most notably, it fails to secure their continued right of free movement within the EU27). The UK government could, of course, have announced unilateral guarantees two and a half years ago, sparing many EU27 citizens sleepless nights. For its part, the Commission could have proposed unilateral guarantees for UK citizens months ago. UK and EU27 citizens who have moved are caught between the Scylla of the UK government's cynicism, on the one hand, and the Charybdis of the Commission's indifference, on the other. Alternative approaches are possible: either a treaty ring-fencing rights on both sides (as I suggested here), or a unilateral measure by the EU as a whole protecting UK citizens’ rights (as I suggested here). To achieve either objective, the European Parliament needs to get pushier with the Commission, making UK citizens’ acquired rights a genuine priority and exerting whatever pressure it can to shake the other institution out of its torpor. If that means cutting off the supply of cognac to the Berlaymont, so be it. Nice post, there are huge lack of transparency about "Brexit". People should know about their right. I think this post will help them a lot.